Verizon’s claim of 10 launch devices for its 4G LTE network has been slow to materialize, but the handsets are on their way. The HTC ThunderBolt has hit shelves and the LG Revolution should be coming soon. Why the delay? Well, 4G has been a hassle to integrate, sources tell me; but the network has launched and is waiting to be tested. At the show, devices like the LG Revolution were pulling between 6 and 13 Megabits per second download speeds without much hitch, but the demonstrations weren’t as geared toward speed as they were when we first tried out the Revolution at Verizon’s CES press conference in January. Aside from its browsing speed, the Revolution is actually a bit of a devolution in terms of raw power. Like all first-generation LTE handsets, it runs on a (non-advertised) single-core 1GHz Snapdragon processor while the newest suite of high-end 3G and HSPA+ phones sport dual-core processing goodies. 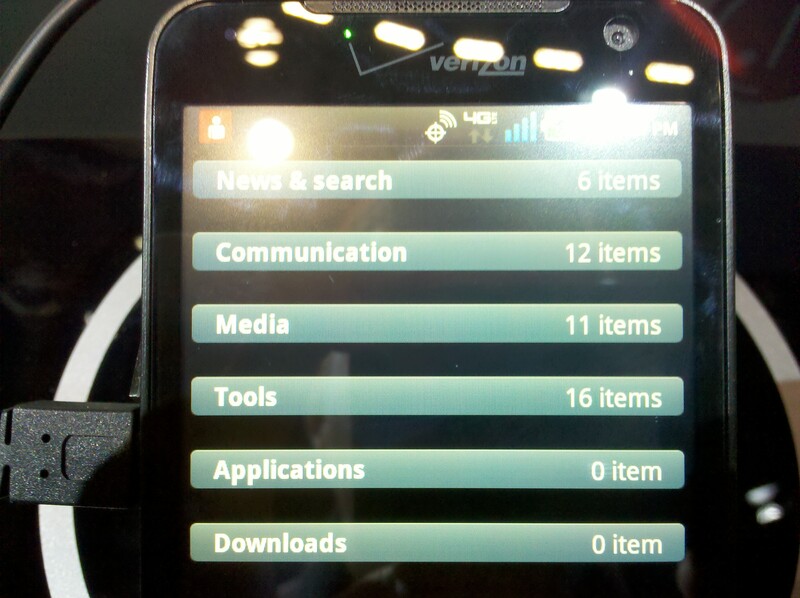 It’s lack of Gingerbread support is also saddening, but LG reps said the phone will get Gingerbread eventually. Still, the Revolution has a competitive 4.3-inch screen with a 480×800 resolution, a Swipe keyboard, an HDMI port capable of mirroring/cloning the phone screen directly to an HDTV, DLNA streaming, a 5MP auto-focus rear camera, 1.3MP front camera, can record 720p video, and can become a 4G mobile hotspot. Most notably, the device has 16GB of built-in memory. This is great for those with a lot of media as most high-end Android handsets currently come with 8GB of storage. The image above gives a good impression of the LG Revolution’s width, which is greater than most cutting-edge non-4G phones. Those hoping for a bite-size 4G experience won’t find it here. Still, the phone felt pretty solid and wasn’t excessively heavy, considering its thickness. Like all Android manufacturers, LG has added its own unique features and look to Android. 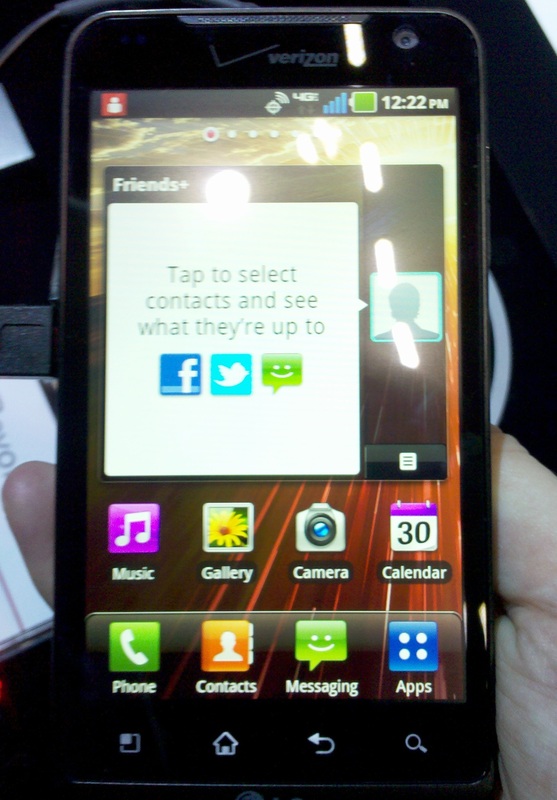 The LG design uses brighter, iPhone-like square icons in most places with a concentration on customization. Using inward and outward pinches, you can easily create and manage categories for your applications, a useful feature for those of us with a lot of apps. Pinching on the homescreen also gives you a birds-eye view of all seven homescreens, allowing you to reorganize them and shift them around. Oddly, though this is a great new feature, Samsung and HTC also had this homescreen functionality built into their newest handsets. Competitive spying? I think so. Perhaps Google should implement this feature into the stock version of Android. While it offers a lot for a first generation 4G LTE phone, like its brothers the Samsung 4G LTE and HTC’s ThunderBolt, LG’s Revolution has a few major hiccups. If browsing at 4G speeds is important enough that you’ll sacrifice a bit of power and battery life, this is a good handset to test the LTE waters. However, if you’re patient, better LTE phones are on the horizon. No pricing or release dates have been given for the Revolution, but we suspect it will retail for $249, much like HTC’s ThunderBolt. The video below was taken on the CTIA 2011 show floor.